Anyone who’s anyone knows that the only keyboards worth their salt are mechanical keyboards thanks to their beautifully engineered switches that type like a dream and last an eternity. The only problem is that such keyboards tend to be quite bulky. It’s not an issue if you’re using them on a desk, but they’re less appropriate for laptops. This has left billions of notebook users in a lurch with dinky, low-pile keyboards. That could be about to change very soon, however, with the introduction of a new low-profile mechanical keyboard switch from German manufacturer Cherry. The switches are a full 35% flatter than their full-size counterparts, meaning they could be fitted into a notebook PC without creating a monstrosity, like MSI’s GT80 Titan. If you’ve ever touched a mechanical keyboard, then chances are the switches in it were made by Cherry. The German manufacturer has been in the keyboard business since the early ’70s, and produces what are considered to be the gold-standard of keyboard switches. The new low-profile switches (which, for now, are only available in Red) are just 11.9mm high, compared to the 18.5mm height of a standard Cherry MX switch, but Cherry went to great lengths to ensure that the classic ‘Cherry feeling’ survived the shrinking. But, somewhat surprisingly, this feeling was maintained not by making a switch with the exact same force curve (which an engineer assured us that they could have done), but by tweaking the force curve to trick you into thinking the switch feels the same when, in fact, the stiffness and actuation point of the switch are subtly different. A cylinder has been placed around the switch’s stem to reduce wobble, and this also contributes to the switch’s IP40 dust resistance. We had a chance to play around with the switches on some prototype boards, and they feel almost identical to the standard Cherry MX Red switch, albeit with a much shorter travel distance. However, the same solid feeling and construction still absolutely shone through. 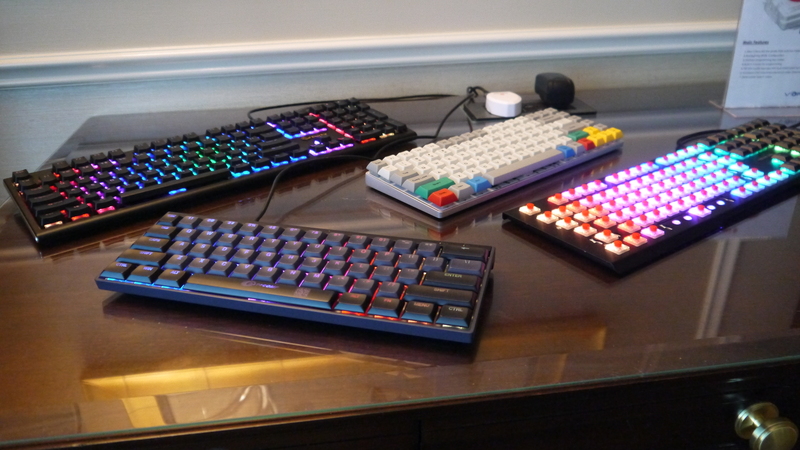 If you want to get your hands on the new switches, then several manufacturers, including Corsair, Cooler Master, Ducky and Vortex are already signed up to produce keyboards using the new switch. The switches will also be available to buy standalone at a later date for those individuals who like to build their own keyboards – although, because of clearance issues, you’ll need to wait for new keycap designs to enter the market before being able to take advantage of the new switches. But the real test of the switches will be notebook PCs. Although they’re much slimmer than standard Cherry MX, the low-profile switches are still much taller than the scissor switches found in most keyboards. This means they’re unlikely to take over anytime soon, but they’ll instead be a high-end option for people that want a premium-feeling notebook keyboard. Cherry eventually intends to make its entire lineup low-profile. The choice to start with the Red switch was apparently a somewhat arbitrary one (we were told the most popular switch tends to vary on a yearly basis), and eventually you’ll be able to get either Blue, Brown, Black or Red switches in the low-profile form-factor. New year, new tech – check out all our coverage of CES 2018 straight from Las Vegas, the greatest gadget show on Earth!